In May, Minsk continued its policy of following in Moscow’s footsteps by exploiting World War II for political purposes. On Victory Day, Belarusian diplomats made statements about alleged ‘attempts to falsify history’. Foreign minister Vladimir Makei invited diplomats posted in Minsk to a controversial historical site featuring a monument to Joseph Stalin. The United Nations supported a Belarusian initiative to honour professional translators and interpreters. This move may also have practical benefits for the country, which has a strong academic tradition in training professional translators. Belarusian diplomats held largely mid-level discussions on trade and political relations with their counterparts from a dozen countries. The only scheduled top-level visit to Minsk failed to materialise when Estonia’s foreign minister postponed his trip indefinitely. In the first half of May, Belarusian diplomats focused on events commemorating the Soviet victory over Nazi Germany during the Great Patriotic War (as World War II is commonly known in the post-Soviet space). To this day, Victory Day celebrations are the Belarusian diplomatic service’s largest public relations campaign. Belarusian diplomatic missions participated in wreath-laying ceremonies, commemorative meetings, concerts, exhibitions, and other events in forty countries alongside their counterparts from Russia and certain other CIS countries as well as local officials. On 5 May, the permanent missions of Belarus and Russia to the United Nations organised a commemorative ceremony in New York dedicated to the 72nd anniversary of the Great Patriotic War. Tellingly, diplomats from Georgia, Moldova, and Ukraine refused to join other post-Soviet countries in the ceremony. They object to the use of the historical event as a tool for achieving modern political goals. A day earlier, the delegation of Belarus to the OSCE made a statement dedicated to Victory Day on behalf of Armenia, Kazakhstan, Kyrgyzstan, Russia, Tajikistan, Turkmenistan, and Uzbekistan. The statement spoke strongly but vaguely against ‘attempts to falsify the history of the war and erase the tragic lessons of history from our memories’. Thus, Belarus once against sided with Russia, which uses such accusations to carry out political attacks against its neighbours, including Ukraine and the Baltic States. On 8 May, Vladimir Makei invited the heads of diplomatic missions posted to Belarus to accompany him for a visit to Stalin’s Line. However, this ‘historical and cultural complex’ just outside Minsk has virtually no relation to the struggle of Belarusians against Nazi occupation. Makei’s choice of venue is dubious. Belarus has many genuine historical sites and WWII memorials worth visiting for remembrance. However, Stalin’s Line features a monument to Stalin – the butcher responsible for the death and repression of hundreds of thousands of people in Belarus, including most of the country’s elite. Belarus’s implicit support for the Soviet interpretation of the historical events of the mid 20th century will hardly serve to strengthen its ties with its non-Russian neighbours or improve relations with the Western world. On 24 May, Belarus’s permanent mission to the United Nations brought to fruition a new multilateral initiative on honouring professional translation ‘as a trade and an art’. The UN General Assembly adopted a resolution on the role of professional translation in connecting nations and fostering peace, understanding, and development. Twenty-seven nations co-sponsored the document, which Belarus initiated and drafted together with Azerbaijan. The resolution declared 30 September International Translation Day. 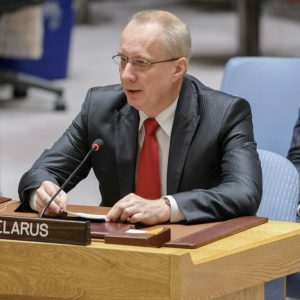 Unlike certain other Belarusian initiatives, such as on protecting the traditional family, this idea met with no resistance from other members of the UN. The particular attention Belarus pays to this profession is no coincidence. Many senior Belarusian diplomats, including the country’s ambassador to the UN Andrei Dapkiunas, who introduced the resolution, hold their first and sometimes only academic degree in professional translation. Many Belarusians work as translators or interpreters in the Russian section of the UN translation service. The Belarusian State Linguistic University signed a memorandum of understanding with the United Nations on training candidates for competitive language examinations. Belarus intends to further develop this idea by initiating an international instrument that would enhance the legal protection of translators and interpreters in situations of armed conflict and post-conflict peace-building. As the summer holidays approach, the Belarusian foreign ministry is intensifying its political and trade consultations with countries from different regions of the world. However, the only top-level foreign dignitary to visit Belarus in May was the outgoing Serbian president. Belarusian officials received officials from Turkmenistan, Tajikistan, and Egypt in Minsk on 10, 18, and 25 May respectively for meetings of bilateral trade and economic commissions. They also met in the same format with Czech officials in Prague on 16-17 May. Belarusian exports to the Czech Republic, Tajikistan, and Egypt dropped dramatically in 2016 compared to 2015. However, this trend was partially reversed in January-March 2017, when Belarus’s deliveries to Egypt and Tajikistan increased manifold (4.2 and 2.4 times against the same period of 2016). Exports to the Czech Republic have continued to decline. In relations with Turkmenistan, the Belarusian government is sticking to its declared goal of a $500m turnover, encouraged by a modest recovery in 2016 (up to $120.6m). Belarus is now pitching diesel trains, railway cars, and lifts to Turkmenistan. While the two countries have problems with currency conversion in reciprocal payments, Belarus is considering buying cotton under barter arrangements. Also in May, Belarus held consultations on the deputy-foreign-minister level with Pakistan and Turkmenistan in Minsk, Croatia in Zagreb, and Greece in Athens. Working-level contacts took place in Minsk with Finnish and Australian diplomats. The negotiating partners focused on trade and investment issues as well as cooperation in international organisations. The Belarusian foreign ministry had also announced a working visit to Minsk by Sven Mikser, Estonia’s foreign minister, on 23 May. The Estonian diplomat was due to meet with his Belarusian counterpart as well as unnamed ‘leaders of the government and the parliament of the Republic of Belarus’. However, the visit was postponed indefinitely without much fuss. The press service of Estonia’s foreign ministry explained the cancellation by blaming ‘schedule changes in Belarus’. Interestingly, Vladimir Makei was in Minsk on 23 May. In the summer months, Belarus is expected to focus more on multilateral diplomacy as it prepares to host a Minsk meeting of the OSCE Parliamentary Assembly and the Central European Initiative.